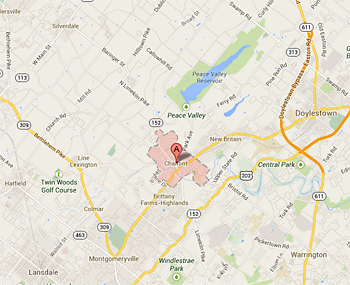 So, you are thinking about buying real estate in Chalfont, PA.
Great choice! This is a nice area of Bucks County. I have been a realtor in the greater Philadelphia area for over a decade, and live in the county, so I know it very well. Chalfont is often requested by my house buyers as an area they would like to buy in. Sometimes homes for sale are scarce, but can be found. Let me help you find your next home or property in Chalfont. Chalfont (also known as the Borough of Chalfont) is located about thirty miles north of Philadelphia, Pennsylvania. Chalfont is home to about 4,009 residents and many thriving local businesses. There are a variety of homes available in Chalfont including single family homes and condos. There are also undeveloped lots available for purchase. Residents of this quaint town enjoy walking through the well-maintained downtown to view the many Victorian homes, most of which are now home to local shops and restaurants. One of of the main attractions of downtown is St. James Church in the historic district. The land in Chalfont is flat - perfect for the many farms to the north of town that keep the residents supplied with local produce. Only a few miles from the center of town is Peace Valley Park and Lake Galena. This park is popular spot for residents who enjoy walking, biking, jogging and sail boating. Every spring,the town is host to the Chalfont 5K, which serves to encourage physical fitness for the towns residents. Although founded in the Victorian era, Chalfont has many modern conveniences. The main part of town is urbanized and pedestrian friendly with sidewalks throughout. The town also has a train to Philadelphia and other large cities. Town leadership has begun a Transit Oriented Development (TOD) plan to make the train station even easier to access for the majority of the towns residents. The TOD plan also includes and initiative to make the neighborhoods near the train station more pedestrian friendly. Chalfont schools belong to the Central Bucks District of PA, the third largest district in the state. The staff development program is award winning and the students had the highest PSSA test scores in the county. The school district also won the Ambassador Award from the Central Bucks Chamber of Commerce in 2005. Baseball fans will recognize Chalfont as the home to Bobby Shantz, the 1957 MVP for the American League. At one time, Shantz owned a bowling alley/dinner with fellow baseball player Joe Astroth. The establishment was named the Pit-Catcher and was very popular with the town's residents. I'd like to be you buyer's agent, so contact me today!